It’s not often the term ‘Ambient Trance’ is ever mentioned in a non-satirical manner these days. Furthermore, putting this particularly outdated style of music into context proves an immense challenge. Evidently with all genres of music you will have a relatively small pool of artists pushing boundaries in a wash of sub-par production with producers who will drop standards & creative freedom in order to appeal to a mass audience. Within this minority lies Psychick Warriors ov Gaia, a Dutch ambient, experimental techno outfit that can face a potentially negative stigma if lumped into the aforementioned ‘Ambient-Trance’ category. Whilst their prime ‘PWOG years’ surrounded the early nineties, the groups influences began in the late sixties with the formation of COUM Transmissions & its founder Genesis P-Orridge. Born Neil Megson (in an effort to “trigger his own ‘genius factor'”) legally changed his name to Genesis P-Orridge in 1971. He start COUM Transmissions in 1969 with John Shapiro after “hearing voices describing ‘COUM'” during a family trip to Wales. Their artistic & musical ‘performances’ were raw, improvised chaos & anarchy, making the unstructured genius of Japanese experimental band Ongaku look fairly regimented. The final performance of COUM Transmissions in 1976 was also the debut of Throbbing Gristle, who along with Cabaret Voltaire, are cited as one of the founding bands for the industrial scene. P-Orridge, along with Cosey Fanni Tutti, Peter Christopherson & Chris Carter who made up Throbbing Gristle, not only picked up where COUM left, but the group escalated their performances & created more controversy amongst conservatives. The band’s main focus was challenging the audience, getting them to “think for themselves” & interpret what their performances meant rather than make “attractive music”. Aside from playing various horns, piano, vibraphone & synthesisers, Christopherson used pre-recorded samples, found-sounds & other various noises on tape throughout the shows which laid the ground work for his most notable work with the late John Balance as ‘Coil’. By the beginning of the eighties Throbbing Gristle made their last performance in California after citing a spilt between P-Orridge & Fanni as the reason. Like any classic divorce, the band split in two & formed new projects; more specifically P-Orridge & Christopherson went on to form Pyschic TV with Alex Fergusson. From there, the video-art & music outfit had wave after wave of collaborations with many notable artists in their initial decade long stint, including John Balance, Andrew Weatherall & Hilmar Örn Hilmarsson (of Current 93, Þeyr, + many more). Thee Temple ov Psychick Youth (T.O.P.Y.) was formed as an organisation at the same time as Psychic TV & was intended to be the philosophical wing of the group, however the outcome was more of a cult-like community for fans & like-minded “philosophers”. Many of the teachings were reflective of the poet William S. Burroughs & Brion Gysin, a performance artist who P-Orridge met through Burroughs & later played a huge role in influencing his work, as well as tutoring P-Orridge in the art of magic. 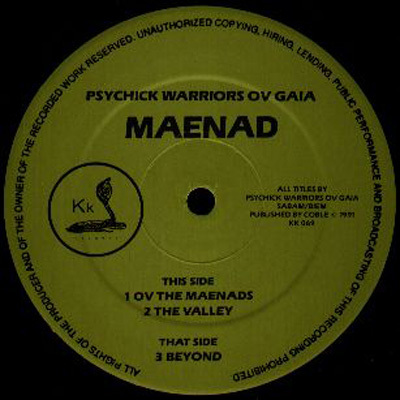 From these teachings, a group of Dutch artists who started out as in Industrial outfit called the Infants in 1985, evolved into Psychick Warriors ov Gaia by the turn of the decade. Like Psychic TV, the artists of PWOG varied with Boris Hiesserer, Joris Hilckmann, Reinier Brekelmans & Tim Freeman making up the core members. They remained relatively anonymous during their career with many of their live shows performed behind a giant screen. The first release under the PWOG moniker was a two side cassette tape in 1989, which by now is almost impossible to find. The combination of tribal, trance & ritualistic techno is a genuine reflection of the underground electronic scene in Holland during the early nineties. ‘Exit 23’ closely followed as their second release on Belgian industrial label KK Records. Both parts ‘Source’ & ‘Return’ are intended to be played consecutively for the ‘ultimate hypnotic state’. The tracks also feature a vocal sample from Timothy Leary, a pro-psychedelic, American psychologist. Finally, our personal favourite, ‘Obsidian’ was brought to our attention recently during Ron Morelli’s Beats in Space podcast. This twenty minute opus has an amazing palpable aspect to its production, standing the test of time & counters the notion that all ‘Ambient-Trance’ is should be swept under a rug & forgotten about.